Meme: Friday’s 5 O’Clock Shadow | Kris Johnson's Blog…sort of. 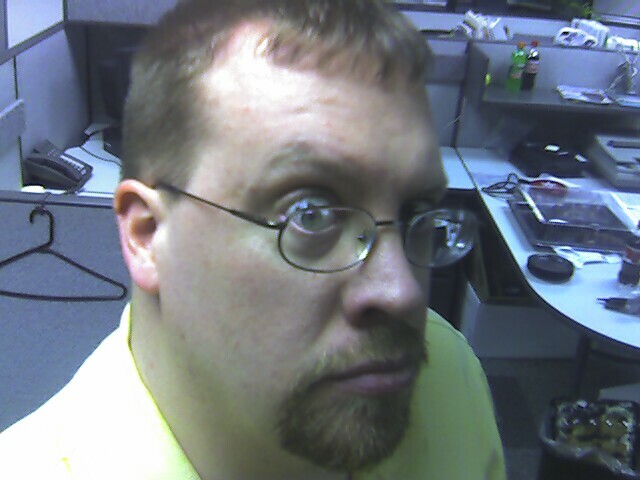 Today’s five o’clock shadow was aged two hours because at the appointed hour I was hip deep in the Windows 2000 registry and nobody wants to see that. I actually had some stubble this morning, but decided to shave before leaving for work, despite the fact that I was running about an hour late. The day started off with a bird stuck in the chimney and a trip to the drug store to pick up some cough medicine for Kyle, who is a bit under the weather at the moment. Previous PostFriday’s Feast for 23 March 2007Next PostNon Sequitur: Sinuses! I officially don’t want to meet you on a dark street. It’s the shirt, isn’t it? A bird stuck in the chimney?